The Cayman Islands enjoy a very warm, tropical climate throughout the year, with temperatures that can reach highs of up 33°C (91°F) during the summer, moderated by trade winds. The best time to visit is during the dry months of December to April, when temperatures are generally cooler than in summer, hovering between 22°C (72°F) and 27°C (80°F). The rainy season is from May to October but showers are generally short and sharp (ie lasting hours rather than days); these can provide temporary respite from the hot summer sun. July and August are the hottest months, whilst the hurricane season is from June to November. Since the islands are low-lying, there is a high risk of flooding if a storm hits. During the dry season, wear lightweight, natural fabrics; temperatures rarely dip below 21°C (70°F), so you shouldn't need anything much heavier than this. A good strategy is to take layers, so that you can be ready for cooler conditions should the trade winds blow strongly. During the rainy season, bring a light raincoat or umbrella. Warmer clothes may be needed on cooler evenings. The Cayman Islands are situated in the Caribbean, around 440km (270 miles) northwest of Jamaica, 390km (240 miles) south of Cuba and 640km (400 miles) south of Miami. At around 197 sq km (76 sq miles) Grand Cayman is the largest and most populous island in this British overseas territory. Little Cayman and Cayman Brac lie around 130km (80 miles) northeast of Grand Cayman and are separated from each other by a channel about 16km (10 miles) wide. The islands are peaks of a very deep subterranean mountain range called Cayman Ridge, which extends from Cuba towards the Gulf of Honduras. All three islands are situated in some of the deepest waters in the Caribbean; the Cayman Trough which separates them from Jamaica reaches a depth of 6.4km (4 miles). The islands themselves are relatively low-lying, with the highest point on Grand Cayman reaching only 18m (60ft) above sea level. The Bluff, a magnificent limestone peak on Cayman Brac is the highest point on all three islands, reaching an elevation of 43m (140ft). 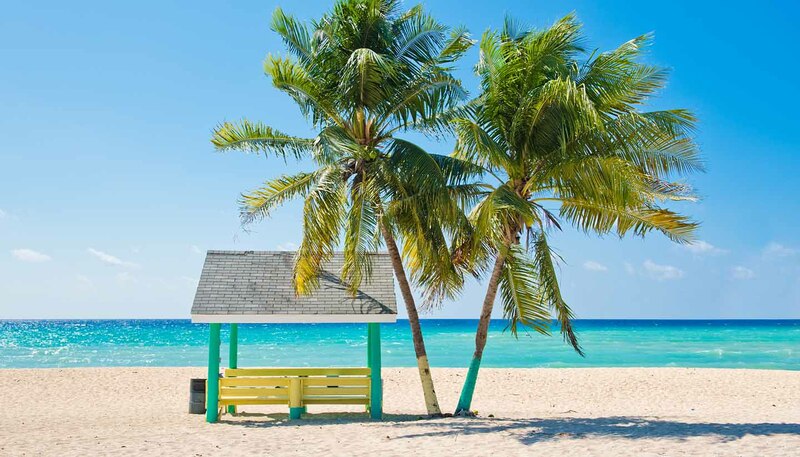 The beaches on the Cayman Islands are considered some of the very best in the Caribbean, the most notable one being Seven Mile Beach on Grand Cayman. Casuarinas and sea-grape trees line many of the beaches, many of which are protected offshore by a fringing reef.